The Main Street Electrical Parade was welcomed back to Disneyland after 21 years away from the original parade route. The parade will run from January 20-June 18, 2017. I was in the park for the “premiere event” which included a red carpet, debut performance of the parade, and nearly all Disneyland attractions open. There were less than 10,000 people in the park and we walked on to every attraction. It was an incredible evening! See other special events and decide when to visit Disneyland with our 2017 Disneyland Crowd Calendar and special events listing. The Main Street Electrical Parade event was made up of a fascinating mix of attendees with Disney executives, select members of the media, and parade fans who opted for the $95 event ticket. With limited attendance numbers, the event was a fantastic opportunity to see the parade and experience attractions. The Main Street Electrical Parade still holds up to the test of time. There is something about the mix of the classic Christmas tree light look and the floats featuring a mix of classic and now obscure characters that make magic. For me, the parade experience started off a little bit weak as I compared the opening float to that of the high-tech “Paint the Night” floats. However, after the whirling bugs spun by, I was filled with an overwhelming sense of nostalgia for the parade. This nostalgia combined with the designs of the later floats, an incredible soundtrack, and the location back in Disneyland made this a parade experience I won’t soon forget. The parade, which debuted in 1972, has been a staple of the domestic Disney theme parks ever since. After performing on and off from 1972-1996 inside Disneyland park, the parade officially “glowed away forever.” But, nothing can keep this classic away. The floats were pulled out of the mothballs to perform as the night time entertainment in Disney California Adventure park from 2001 to 2010. The parade was shipped to Walt Disney World in Florida in 2010 when Disney California Adventure got too crowded with construction for Cars Land. It was during the Disney California Adventure run that I first experienced Disney’s Electrical Parade. I can remember vividly seeing Pete riding on Elliott the Dragon rounding the corner into the old Sunshine Plaza at the entrance to the theme park. With corn dog from the Corn Dog Castle in hand, that time will forever be stuck in my mind as a moment of pure Disney magic. Thus, it is fitting that the float that was chosen to be displayed for photos during the event after the premiere of the parade was the Elliott the Dragon float in addition to the whirling bug floats. I went a little crazy with the photos capturing the floats from all angles fitting in photos with the “Partners” statue and castle (you can see many of these on the Facebook page and below). The park was filled with Disney executives including Michael Colgazier, the President of the Disneyland Resort, who graciously paused to catch up with me, before continuing his walk down Main Street. He was joined by Disneyland Park Vice President, Kris Theiler. I always enjoy seeing the executives out in the park and hearing their perspective on operations. Reportedly, Michael Colgazier called into the main parade operations from his car on the freeway to tell them to start the parade early as it was pouring where he was. From the weather satellite tracking, the Cast Members could tell they would make it just in time if they ran the parade at the planned 9 pm step off time. And, just like magic–Disney magic perhaps–the rain held off until moments after the last float stepped off stage. The leading float from the Main Street Electrical was out for pictures as we were leaving the parks. As I was leaving the parks, I experienced what I am convinced is a well coordinated attempt by the Disneyland powers to tease me. When I was walking by the Rivers of America after riding the Haunted Mansion (which we rode in our own private stretching room lying on the ground), all of the “Fantasmic!” light towers were raised and entertainment technicians were testing out a row of show fountains right in front of the island. After I lingered for a little while, a security guard told me it was past 12 and the parks were closed. They needed me to move along so they could start making the magic for this summer’s return of “Fantasmic!”. There is so much in store for Disneyland and this summer will be fantastic, or should I say “Fantasmic!”, with the return of my favorite night time show, the Disneyland Railroad, and the Rivers of America boats. If you are a planning a Disneyland vacation, visit MickeyVisit.com for information on when to visit Disneyland 2017 crowd calendar, how to find discount Disneyland tickets, and our Universal Studios Hollywood discount tickets guide. 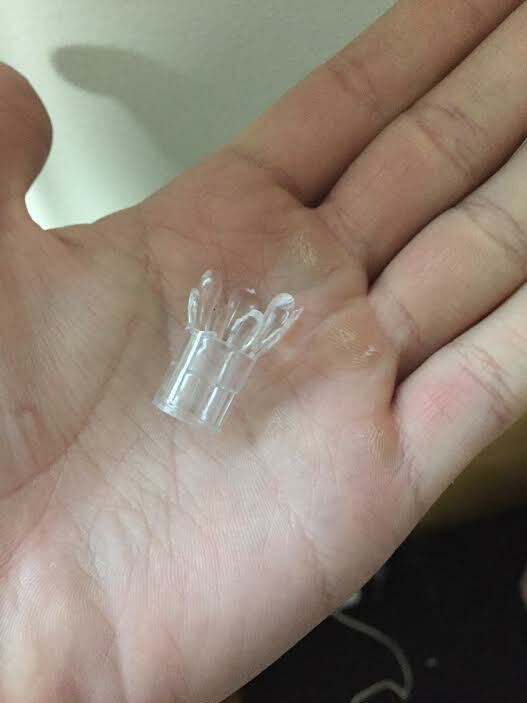 And one more thing…as the end of the parade was passing me by, a parade tech Cast Member handed me a broken light cover off a float. So cool! 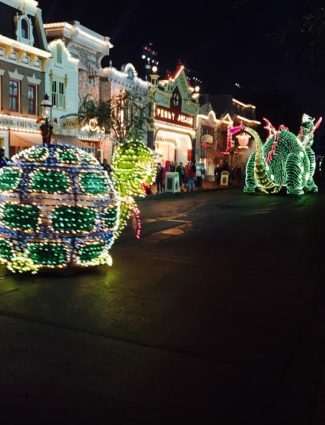 Be sure to check out the Main Street Electrical Parade now playing in Disneyland until June 18. See the official Disneyland website for official performance times. you always have great info! Thank you Gavin. Hope your first semester went well. 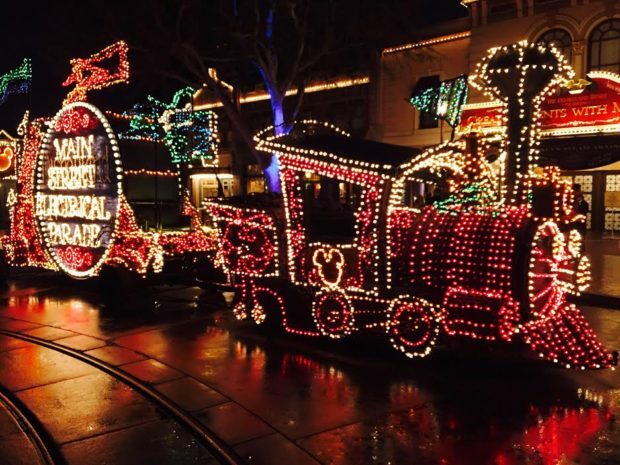 Do you know who wrote the iconic electric light parade music? Is that coming back with the classic floats? The “Baroque Hoedown” has returned to Disneyland with the parade. The song was written by Jean Jacques Perrey.